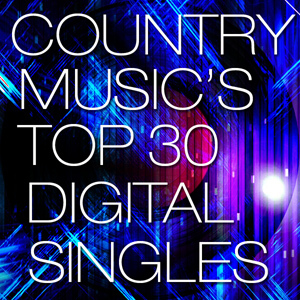 Florida Georgia Line's reign on top of Country Music's Top 30 Digital Singles chart continues with "Cruise," one of three tracks inside the Top 15. Meanwhile Eli Young Band debuts in Top 10 with "Drunk Last Night" Continue on to view the entire Top 30 Digital Singles chart! Florida Georgia Line’s “Cruise” once-again holds the pole position on the chart with another 200,000 copies of the track hitting 50 year record-breaking marks and within sight of becoming the all-time best-selling Country single. Blake Shelton’s “Boys Round Here” is second. The Top 5 songs settles back into songs that are on the charts at the moment with “Cruise” now having sold nearly 4.75 million copies while Blake Shelton’s “Boys ‘Round Here” has moved nearly 1.5 million copies. Hunter Hayes’ Top 10 radio airplay hit “I Want Crazy” surpasses the 800k mark and is well within Platinum certification. Darius Rucker’s “Wagon Wheel” sits at #4 and is well within Double platinum with sales at 1.8 million. Rounding out the Top 5 is Luke Bryan’s Billboard Radio Airplay #1 hit “Crash My Party.” The single has sold nearly 900k tracks to date. Randy Houser’s rebirth as top-selling Country star continues with “Runnin’ Outta Moonlight” sitting at #6 this week. The sure-fire #1 Airplay hit in waiting also surpasses Gold certification eligibility which makes the song Houser’s second-consecutive single to hit the prestigious mark. Houser’s career hits include “Boots On” and “How Country Feels.” Sitting at #7 this week is Eli Young Band with their latest hit “Drunk Last Night.” The single moved 53k tracks this week. “Highway Don’t Care” at #8 and has moved 1.35 million copies to date. Brett Eldredge breaks into the Top 10 with “Don’t Ya” for the first time (also the first time of his career). The single has now moved 385k to date and has room to hit Gold in the next three weeks. Finally, Florida Georgia Line’s “Round Here” enters the Top 10 for the first time and has now sold 252k to date. “Redneck Crazy” helps Tyler Farr hit #11 and notables include Debuts from Kelly Clarkson (“Tie It Up”) and Toby Keith (“Drinks After Work). Finally Kacey Musgraves “Blowin’ Smoke” returns to Top 30. Tyer Farr’s at #11 with “Redneck Crazy,” the title track to his upcoming album. He’s now sold 322k copies of his break-out hit to date. Thomas Rhett’s own break-out “It Goes Like This” is inside the Top 15 while Billy Currington’s “Hey Girl” is this week’s “Riser of the Week.” Kelly Clarkson debuts at #18 with “Tie It Up” while Toby Keith debuts with “Drinks After Work” at #25. Chris Young “Aw Naw” up 12 slots to #31 with sales nearly 94k in 6 weeks. Justin Moore “Point At You” at #32 with 177k sold to date. Cole Swindell is at #37 with sales totals at 90k in 8 weeks. Blackjack Billy is at #38 with sales totals at 45k in 7 weeks. Lady Antebellum’s “Goodbye Town” -- their latest radio single -- is up 21 slots to #43 with sales totals at 72k to date. Parmalee is up to #51 with sales now totaling 131k. Joe Nichols “Sunny and 75” is up 33 slots to #54 with total sales at 44k. Colt Ford/Jason Aldean’s “Drivin’ Around Sound” is at #71 this week with sales now nearly 200k. Singles From The Voice singers Danielle Bradbery and The Swon Brothers.